As much as I would love, love, love to have a nice tidy everything-in-its'-place abode, I'm still doing what I always do...flitting around from one thing to the next and not doing what is probably more important for my well-being. Truly...I'm like a crow with shiny objects tempting me! I've been working fairly regularly on a stitching project...a "my way" take on the Alabama Chanin DIY Magdalena Fitted Cardigan. Instead of spending $298.00 on the ready to stitch cardigan, I'm doing it the hard-but-way-less-expensive way. This is usually when I get into trouble...generally speaking, it would be more efficient to buy the ready to sew kit. By the time I collect what I need, cut the stencils, stencil the fabric, I'm kind of "over" the whole project. Not this time though! 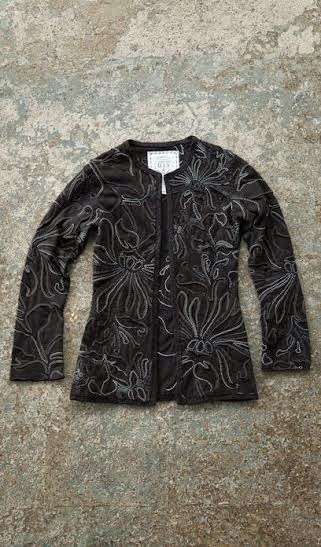 I love the clothing on the Alabama Chanin website...I love everything about AC-style. Hope I can pull this off! 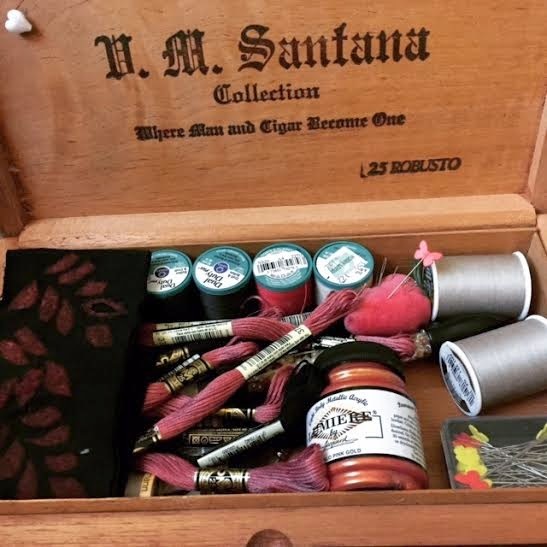 Some of my stitching stuff...fabric paint, button & craft thread, embroidery floss. Ready for the shirt as soon as I get that big stencil finished! So, instead of organizing for the new year, I'm still jumping from project to project. I don't even know why I think things will change! Back half of January---where does the time go?